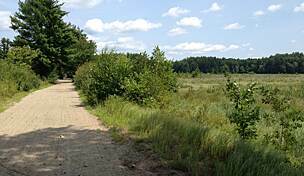 The Piscataquog Trail, though only about 2 miles long, provides a vital off-road link between the communities on the western side of the Merrimack River (the West Side of Manchester) to several parks and ball fields and the downtown core. 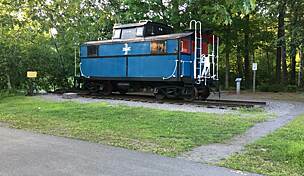 Picking up at the eastern end of the Goffstown Rail Trail northwest of Agnes Street on the Manchester town line (ample parking is available at the Sarette Recreation Complex), the trail soon crosses its namesake, the Piscataquog River, over the beautifully reconstructed Irving and Bernice Singer Pedestrian Bridge, completed in 2015. 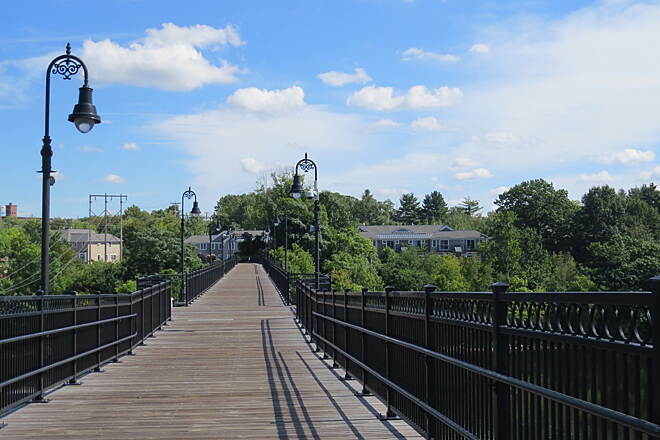 Having not carried a Boston and Maine (B&M) Railroad train car since the 1980s, the trestle was removed, and with a mix of funding sources, including a donation from the Singer family, the new bridge now carries happy commuters, families, and pets. 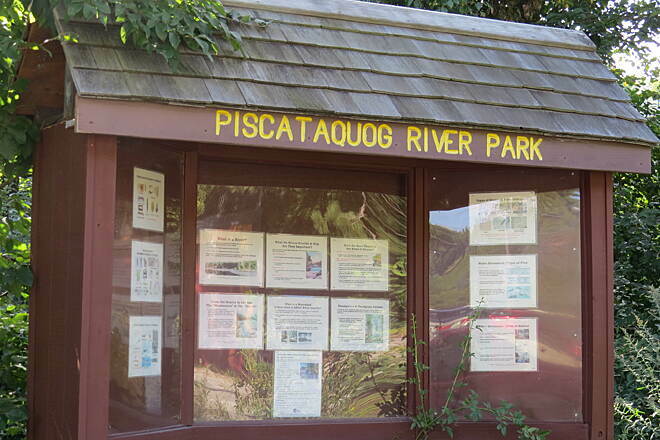 The route crosses under Pinard Street and then begins to loosely parallel the Piscataquog River, offering numerous connections to Piscataquog River Park. 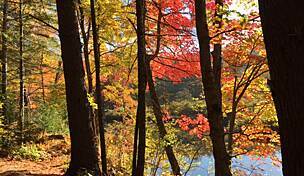 Preserving most of the stretch of river from the dam to the Merrimack River, the park offers its own system of hiking trails and is a popular retreat for fishing or just relaxing in nature. On the south side of the Piscataquog Trail, you’ll find West Side Ice Arena—a primary trail access point with further access to the water—and baseball diamonds. On the north side, you’ll find Thibault Field, which offers restrooms and convenient parking about 0.75 mile from the western endpoint. 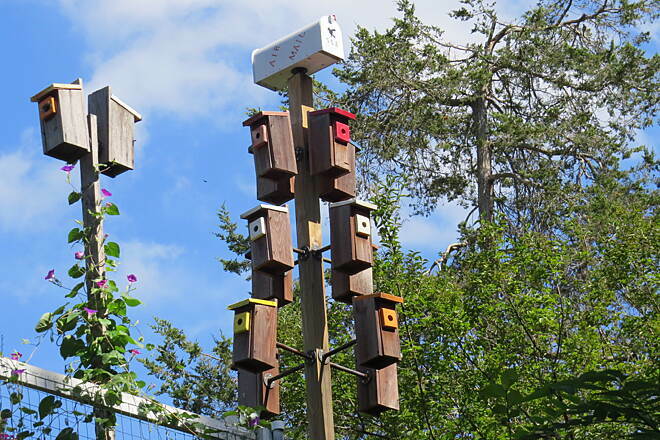 Just after passing under Granite Street, look up and to your left for a colorful collection of birdhouses that stands guard over the trail, where you might spot a chickadee, warbler, northern cardinal, or purple finch, the latter of which is New Hampshire’s state bird. 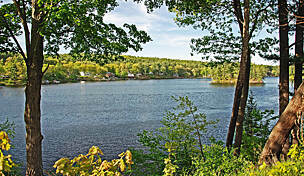 You’ll sense the city nearby as you emerge from the trees and cross South Main Street in the Piscataquog neighborhood. 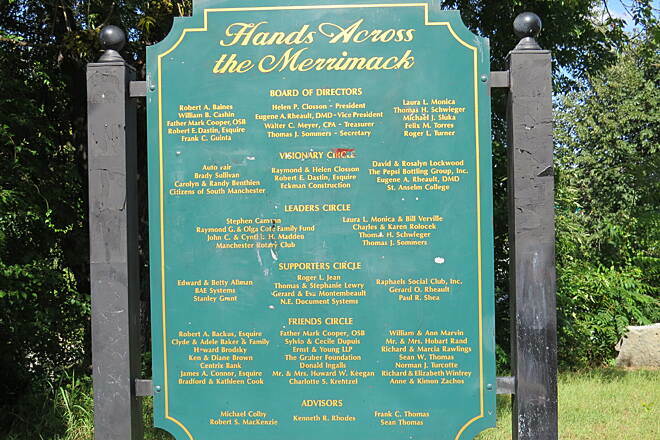 In just 0.25 mile, you’ll enter the Hands Across the Merrimack Bridge, which was completed in 2008 after a conversion from an existing B&M truss bridge. 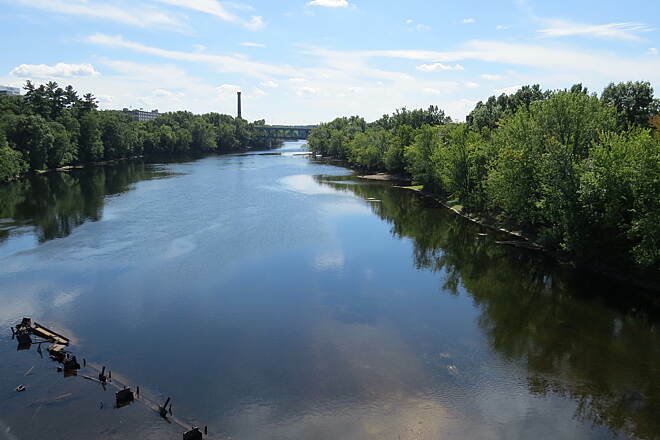 The wide, wooden plank bridge takes you up and over I-293 and then the river and offers an exciting bike--pedestrian alternative to the Granite Street bridge upstream. If you’re not quite ready to finish the trail, you’ll find numerous benches and plenty of room to stop and enjoy the river views. 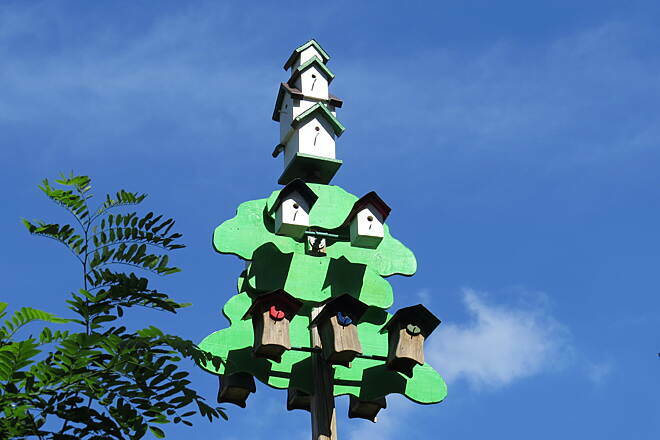 You may even spot a bald eagle. 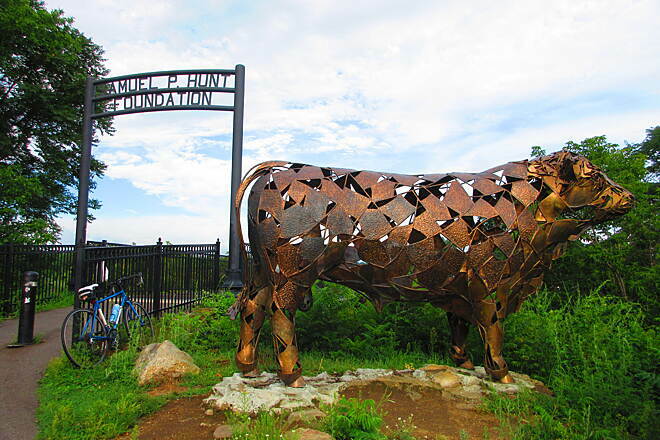 Once across the river, you’ll meet the bronze bull statue that was erected to “commemorate Manchester’s entrepreneurial tradition as exemplified by the founders and employees of Granite State Packing Company and Jac Pac Foods.” Here, you’ll also find the trail’s terminus in Merrimack River Park South Parcel, as well as a connection to the Heritage Trail, which you can take about 0.1 mile north to Delta Dental Stadium and the rest of New Hampshire’s Queen City. 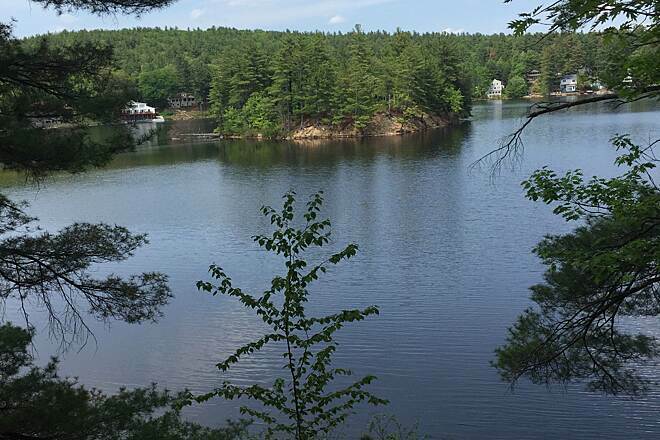 To reach the northwestern endpoint in Manchester from I-293, take Exit 5 for Granite St. toward West Manchester. Head southwest on Granite St., and go 0.1 mile. Use the left two lanes to turn left onto S. Main St., and go 0.3 mile. Turn right onto Varney St., go 0.4 mile, and continue onto Mast Road/NH 114A 1.1 miles. Turn right onto Laurier St., and go 0.2 mile. Laurier St. turns slightly left and becomes Louis St. Turn right into the Sarette Recreation Complex, and look for parking on your left. To reach parking at West Side Ice Arena from I-293 S, take Exit 6 for Amoskeag St. toward Goffstown Road. Turn left onto Eddy Road, and go 0.4 mile. Turn right onto Bremer St. and go 1.1 miles. Turn left onto Electric St. and cross over the trail, going 0.2 mile to the arena straight ahead. 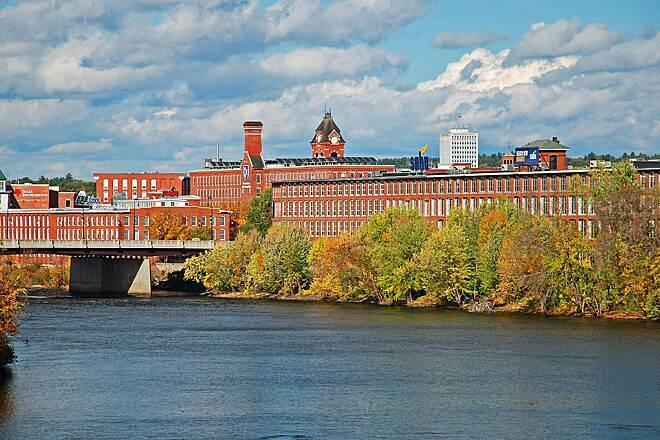 From I-293 N, take Exit 6, and turn left onto Amoskeag St. Immediately after crossing under I-293, turn left onto Eddy Road, and follow the directions above. To reach parking at Thibault Field from I-293, follow the directions above, but take Bremer St. for only 0.6 mile. Turn left onto Boutwell St. and go 0.2 mile. Turn right onto Amory St., and then immediately turn left onto Cumberland St. Go 0.2 mile, and turn right onto Putnam St. Immediately turn right onto Douglas St., and head straight into the parking lot. To reach parking along South Commercial St. (street has a 10-hour limit) from I-293, take Exit 5. Head east on Granite St., and turn right onto S. Commercial St. in 0.2 mile. No designated trail parking is available at Delta Dental Stadium. I took the trail from behind the Fisher Cats stadium in Manchester. The trail starts to the left of some blank red signs in the stadium parking lot. 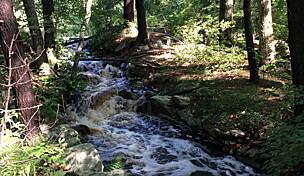 The Piscataquog Trail starts soon thereafter, to the left up the hill. 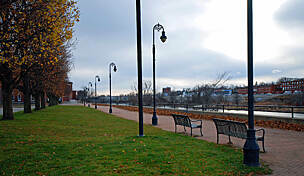 This leads you to the bull statue and the bridge across the Merrimack River. 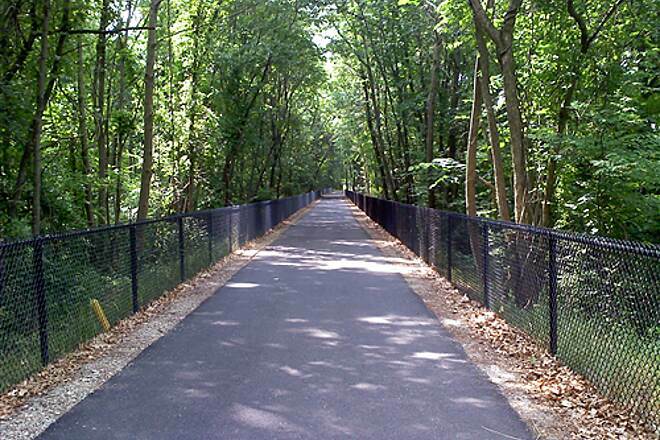 The trail is paved until you reach the Goffstown Rail Trail, which is not. 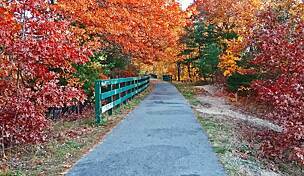 I was riding my road bike and decided to bail to the streets shortly after I reached the Goffstown trail. You can then ride to the center of Goffstown on Rte. 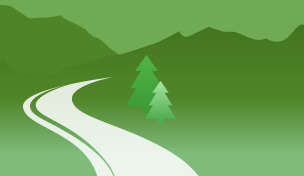 114A, which has a wide shoulder and makes for good road riding. If you ride to Goffstown center, stop at Apotheca for a drink and snack. On the way back, I did not try to find that end of the trail but I understand it is somewhere near the West Side skating arena. One of my favorite trails! A welcome break from the usual but , inviting rural surroundings. When goffstown is completed and paved it will be one of the great ones. We've gone roller blading, skate boarding and have even taken our bikes all the way into Goffstown. Very little traffic, only crosses one busy road in Manchester (South Main St.). Paved portion does stop shortly after Kelly St. bridge and trail does turn wavy for about 100 feet, BUT that is the only spot and probably came across rough because we just got off the smooth paved portion so please continue :) you will be glad you did, the rest is pretty smooth riding. The trail is not terribly crowded, by my standards. We passed people every few minutes. Obviously, I think, it is safe or I would not be going. Hope you have a chance to check it out!!! 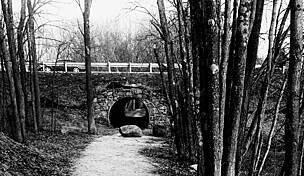 The bridge connecting the Piscataquog Trail to the Goffstown Trail is now open. We rode it yesterday. Beautiful day, beautiful ride. The new trail Bridge over the Piscataquog River by Kelly St bridge is in place, but not open to the public yet. Reports are this will open late September or in October. The crosswalk that is hard to use, because traffic does not care to give pedestrians a break, is South Main St, not Second St. There is a bridge over Second St. While still not open to use, the new bridge connecting the Piscataquog Trail with the Goffstown Rail Trail, kind of under the Kelly St bridge by the Ice Arena, has been set in place. The old trestle was removed, and the new structure appears to be steel with possibly wood decking. Can't wait for it to open so I can ride out and back to my friends in Goffstown, just off Davis park Rd. 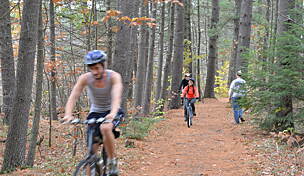 Goffstown just got a grant to fix more of their trail beyond Davis Park Road. The trail was easy to find with the help of GPS. It is a relatively quiet path and well maintained. There are garbage bags hung along the way as well to help keep it that way. I did encounter a homeless gentleman who decided to take a nap on the side of the trail. Since I was with my two children I was hesitant to pass by, as we were otherwise alone on the trail. We did pass and it was uneventful. We continued on and came to the crosswalk at Second Street (which was mentioned in a previous review). We did have to wait a few minutes for cars to stop for us, but not too long. 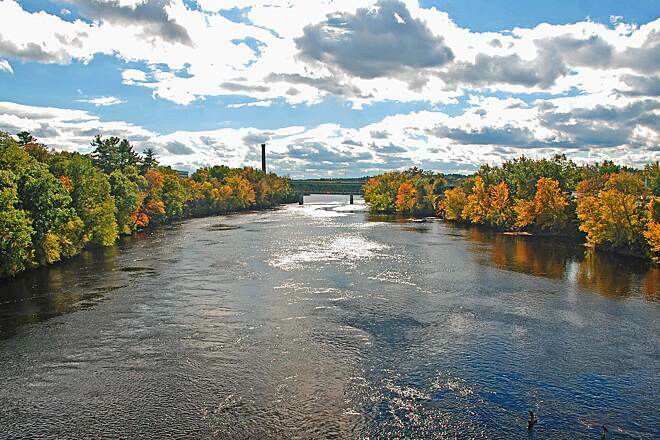 The bridge that passes over the Merrimack is nice. Took some pictures with the kids. They enjoyed it. Probably my favorite part of the trail. There are a few granite benches to sit and take in the view. Overall, the trail was reasonably nice. People generally kept to themselves on their walk or bike rides. We only made it about 1.75 miles before turning around due to time constraints. On our return, we encountered the same homeless man, who was now awake and greeted us. The section from the baseball stadium to the West Side Ice Arena is in fine shape. 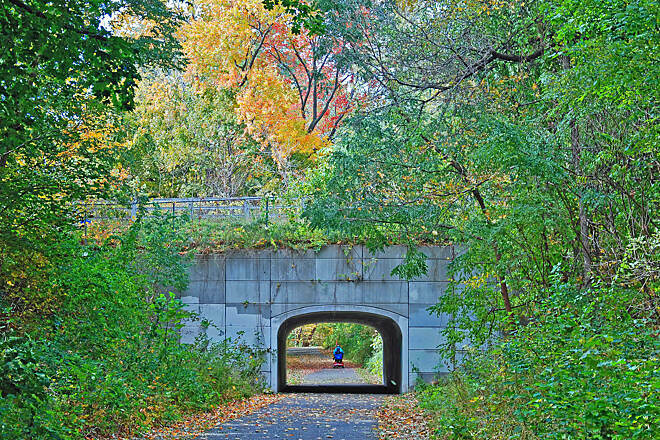 It's a lovely walk or ride, but not hilly or challenging. Although the RR trestle hasn't been repaired yet, there is an alternative way to get across the river, by cutting down behind the arena towards the river, crossing the footbridge and bearing right, up a sandy slope. The train on the West side of the river is in very rough shape - rocky and rooty, with lots of erosion of the slope on the river side of the trail. 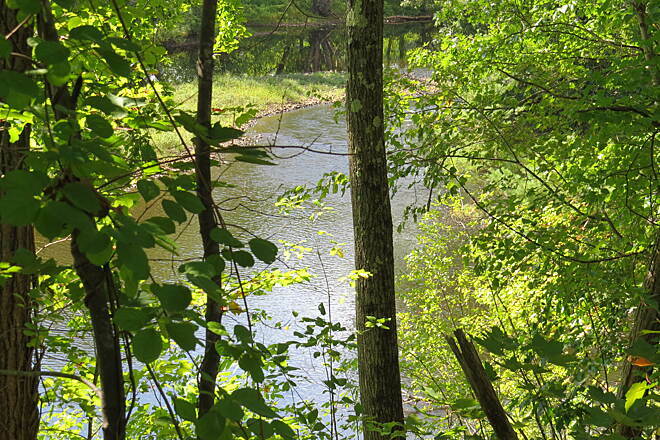 Eventually, the trail broadens out, passing behind and below Mast Road and Route 114, and homes along the river. I haven't followed it all the way to Goffstown. This section is very nicely paved & it's true, you never know your in Manchester. The only problem I encountered is it is difficult to cross Second Street. Even though there is a crosswalk, cars ignore anyone waiting to cross whether pedestrian or bicyclist. I have also biked the Goffstown section from the village to the Manchester line. 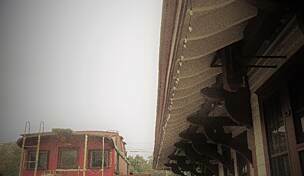 I can't wait for it to be completed and the trestle repaired. 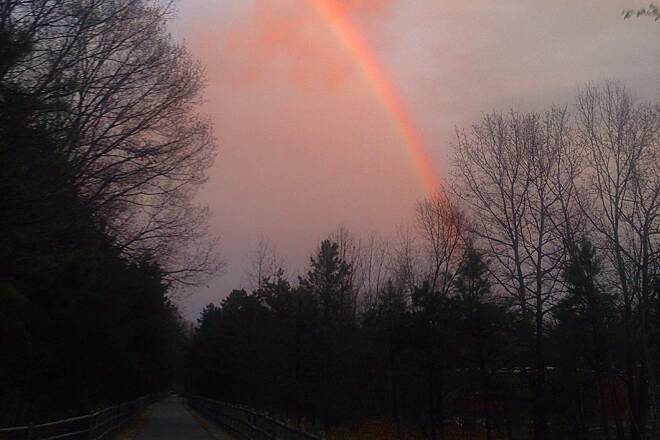 It will be a great ride from Goffstown village all the way into Manchester's east side. Great Addition to the West side. The walk was nicely paved and very quiet. We started at the West Side Ice Arena and walked to the Fisher Cat Stadium end. 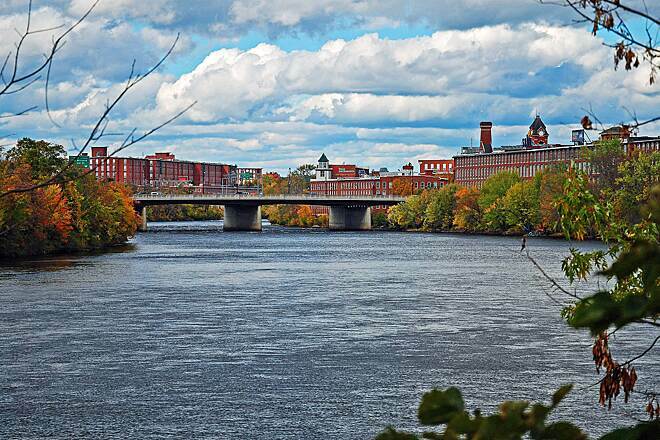 Until you cross Second Street and the Merrimack River, it was easy to forget you were in Manchester. There was very little incline.